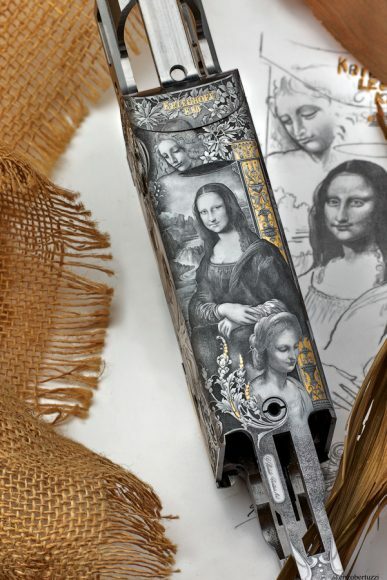 In recent years gun engraving has taken off in a way few could have imagined. Fine guns from the US, UK and Continental Europe are now routinely adorned in a manner that would have been familiar to only maharajas in the past. 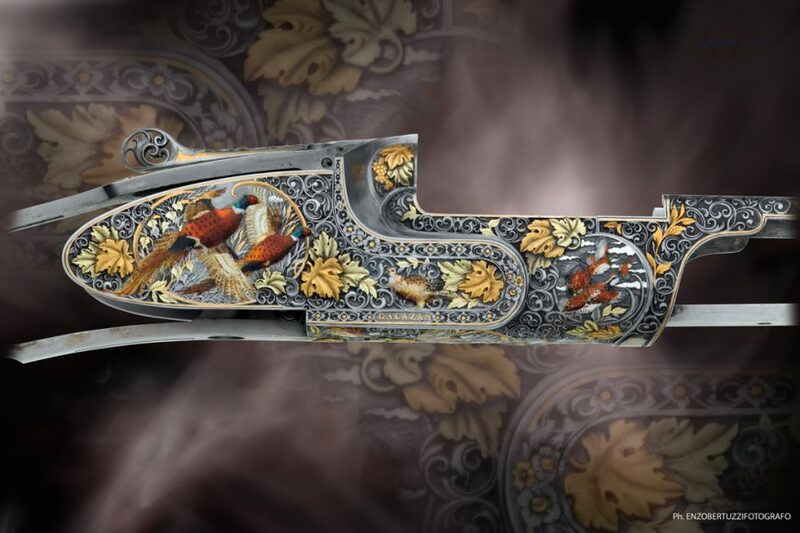 These “high-art guns,” as they are known, are frequently lavished with carved scenes and inlaid precious metals at an unprecedented cost in time and money. The Creative Art team is capable of engraving in almost any style. See the slideshow (top) for work reflective of the artists’ diverse abilities. In 1987 an Italian named Giacomo Fausti presciently recognized this trend when he established an engraving atelier called Creative Art in his home, in Gardone, Val Trompia. The official company history says of its beginnings: “…Fausti, after years of both scholastic and job experience, decided to set up a small laboratory in a room in his house together with another engraver named Ugo Talenti. 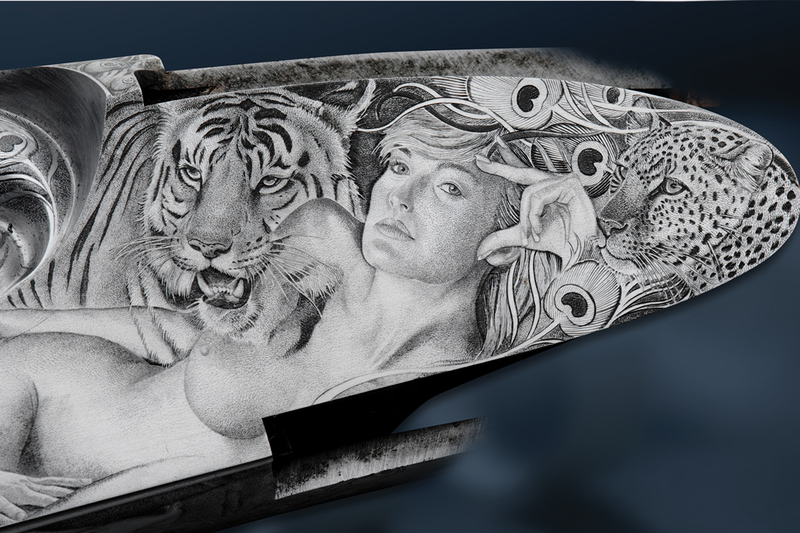 In the meantime, another engraver, Giovanni Steduto, to fully exploit their professional talents, decided to join forces with Fausti and Talenti. With the enthusiasm of those first few years and seeking out new avenues with original and demanding works, the laboratory increased its ranks by acquiring another young engraver: Valerio Peli.” Expansion necessitated moving to a new location in the spring of 1989, and that summer engraver Armando Piardi joined the company. Born in Brescia in 1949, Giacomo Fausti began working with his brother Silvano while attending the Sarezzo School of Art, 13 miles from Brescia’s city center. He initially specialized in chiseled relief engraving and worked with Cesare Giovanelli, an engraver and business entrepreneur who in 1979 opened an engraving school in Magno, Val Trompia, named Bottega Incisioni Cesare Giovanelli. With characteristic verve, the architecture of the building is dominated by a bijou tower in the form of a “punta,” a type of engraving tool. 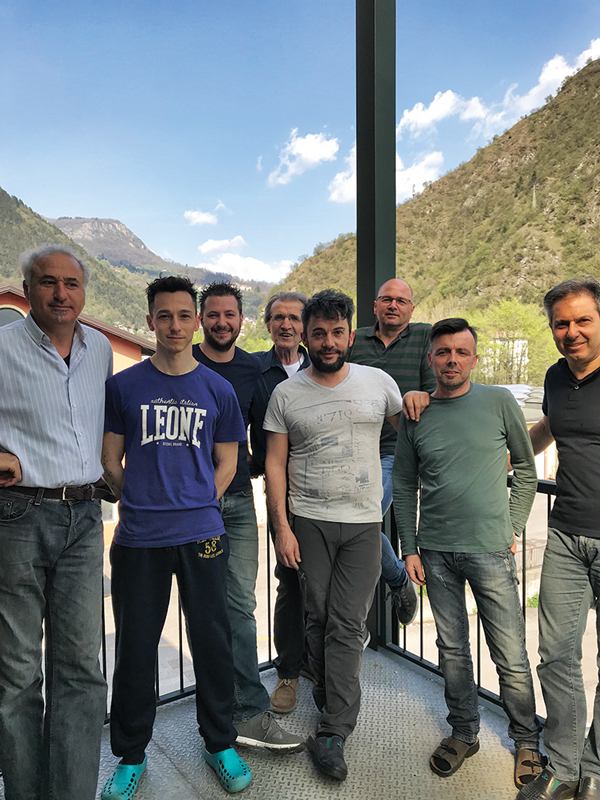 Here Fausti met Beretta’s head engraver, Giulio Timpini, and a superb draughtsman named Leo Campanelli, both of whom provided invaluable experience and guidance. In fact, all of the members of Creative Art credit their experience at Bottega Incisioni Cesare Giovanelli with Timpini and Campanelli as seminal. Mythical beasts on a pair of Fabbris. Photograph by Terry Allen. In the chapter titled “Respect for Individual Styles,” Nobili makes the point that one of Creative Art’s obvious strengths is the ability to integrate and combine the tastes and personal styles of both the client and the craftsman with more generic types of engraving. “In addition,” he says, “each member has his own expressive style and technical methods . . . .” He then points out that the atelier divides the work by type. One example I saw on a recent visit to Creative Art was Giovanni Steduto carving scenes from the battle of the Alamo in bas-relief on a Krieghoff over/under. The toplever, strap and barrel breach eventually would be engraved, inlaid and enameled with foliate scroll featuring symbols from the Texas independence movements, such as the Texas flag, but while I watched, Steduto chased bold, deep-relief scenes of the battle itself. Inspired by images from a pictorial history provided by San Antonio’s Alamo Sporting Arms, who had commissioned the work, Steduto’s engraving shows on the right side of the action Santa Anna’s men charging and dying as they fought to gain access to the old mission, while the left side features Stephen Austin drawing a line in the sand, offering his men the opportunity to escape before the threat of imminent death. The underside features Davy Crockett going mano a mano with a uniformed Mexican. Several members of the Creative Art team contributed to the design and its execution, but it was Steduto’s work that carried the day. 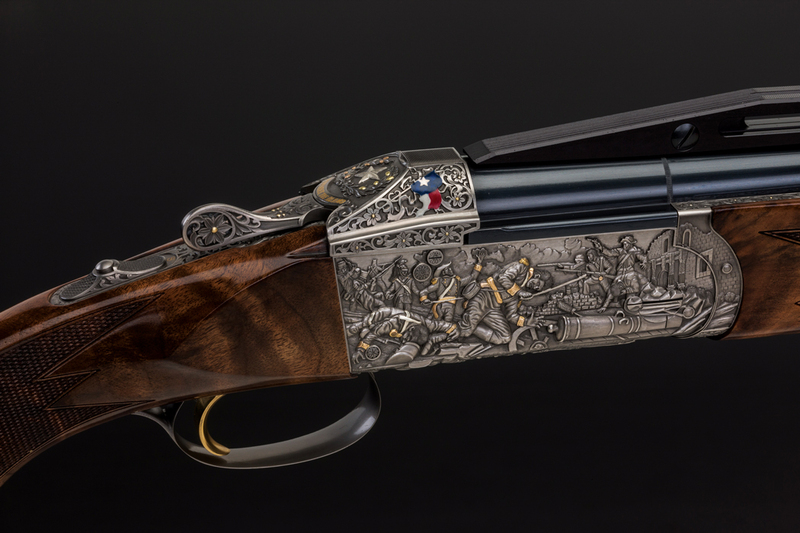 Examples of Creative Art’s work include: Celtic strap work on a McKay Brown (Courtesy of McKay Brown), deep-relief scenes from the Alamo on a Krieghoff, “fantasy engraving” on a FAMARS (Courtesy Courtesy of Creative Art). Perhaps more representational of Creative Art’s division of labor was a Fabbri over/under for guitar god Eric Clapton. One artisan was creating a pierced monogram of Clapton’s initials for the stock while another was engraving the furniture and action with fine scroll. Fausti explained that the lockplates were with independent master engraver Manrico Torcoli, who was embellishing them with game scenes. Torcoli would sign only the lockplates, but the gun could be delivered more quickly and less expensively by apportioning the effort. While clearly capable of mimicking these or any other known style, Creative Art is inextricably linked to “fantasy engraving,” a style pioneered by Torcoli in which multiple images in varying scales are interwoven to create a collage intended to resemble a dreamscape. Desire is usually a strong element of the design with collectible automobiles, exotic creatures and pneumatic female beauties vying for attention. Many traditionalists consider fantasy engraving intemperate—fit only for the nouveau riche—but this makes no difference to Fausti and his team, who are just as adept at conservative bouquet & scroll in the style Jack Sumner created for Boss or the large open scroll familiar from Holland & Holland’s Royal sidelock. Carved games scenes and scroll on a set of Purdeys. Photograph by Enzo Bertuzzi. Versatility is just one measure of Creative Art’s success; the diversity of the firm’s clientele is another. 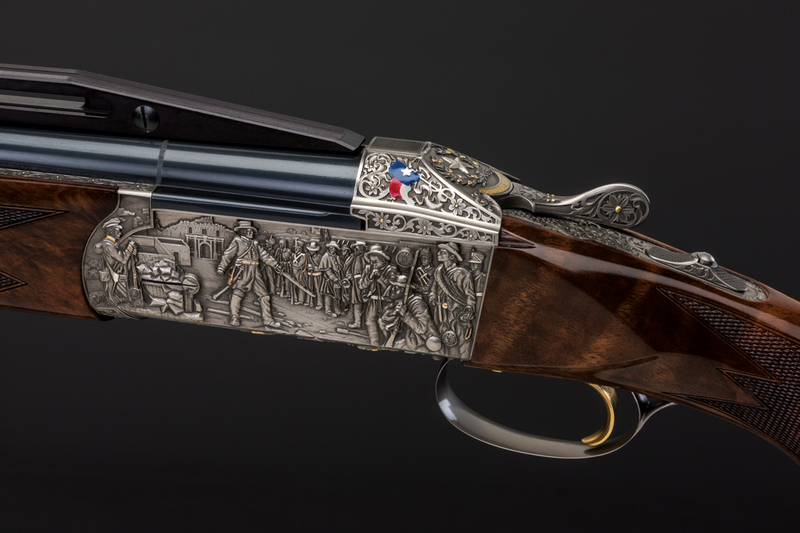 Customers, past and present, include a Who’s Who of great Italian gunmaking, with names like Perazzi, Beretta, Fabbri, Bosis, Cosmi, Piotti, Bertuzzi, F.lli Rizzini, Desenzani, Perugini & Visini and FAMARS. 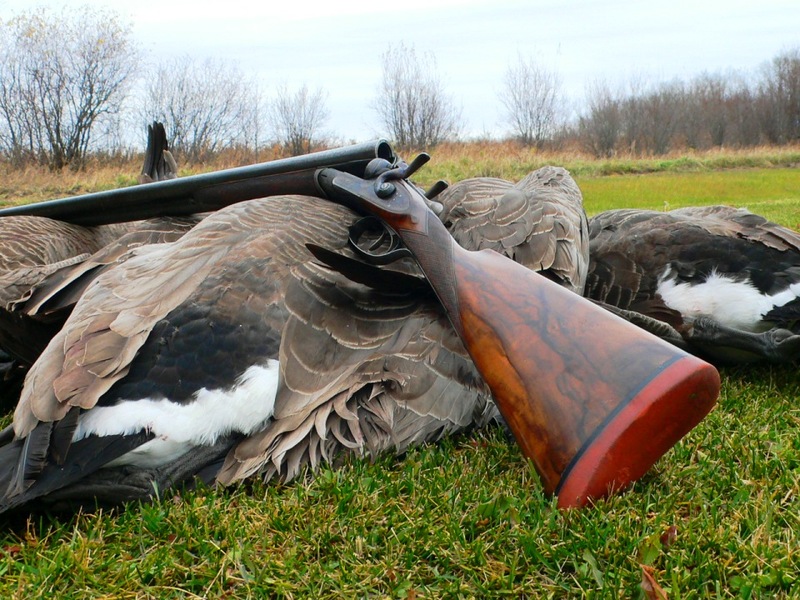 The international fine-gunmaking community is represented, as well, by Connecticut Shotgun Manufacturing Company, Purdey, Rigby, Hartmann & Weiss and McKay Brown. Because of a strong relationship with McKay Brown, Creative Art is currently a leader in traditional Scottish scroll. 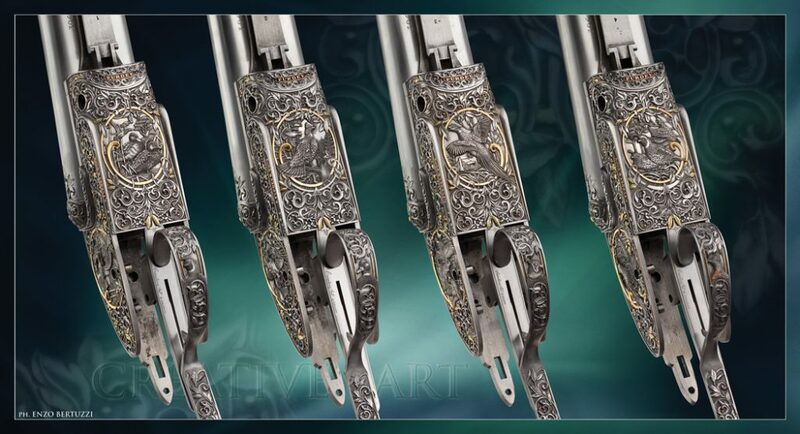 In fact, Creative Art engraves about 90 percent of McKay Brown’s guns and does so in both standard Scottish scroll and a new Celtic pattern based on decoration found on an ancient British helmet discovered in Kirkcudbrightshire, Scotland. 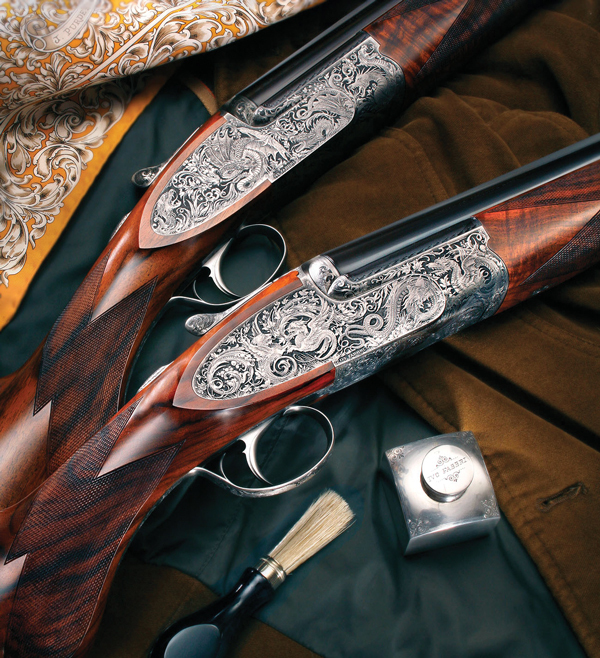 McKay Brown charges just £4,000 (about $5,600) more than the standard price for a gun in either style. 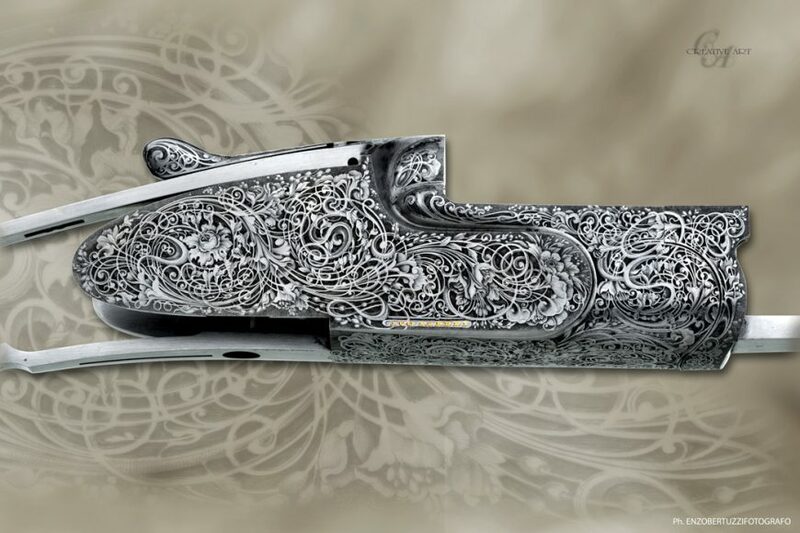 According to company owner David McKay Brown: “As a manufacturer of fine guns, of which we complete around 28 per annum, it would be impossible to meet our delivery dates without the help of Creative Art. 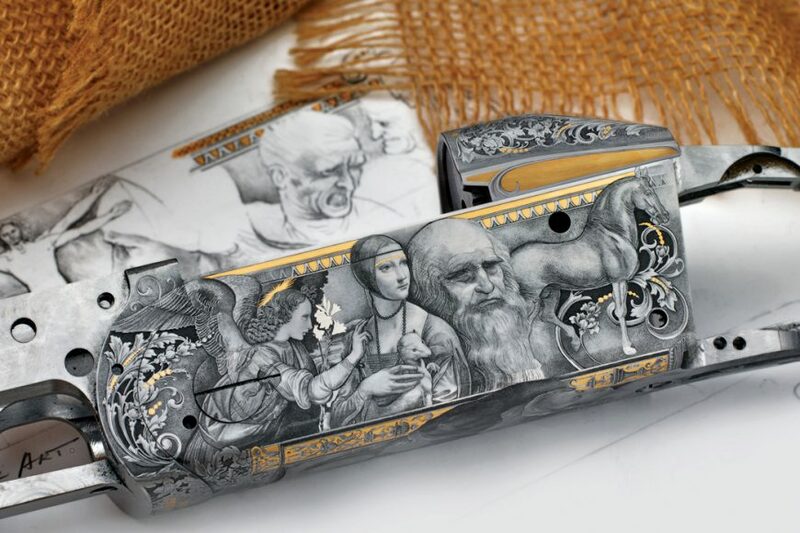 I believe Creative Art are the equivalent of what the London gunmakers had in their heyday when they were producing large numbers of guns and relied on independent engravers such as [Harry] Kell and [Jack] Sumner. There were a number of engravers in a workshop, each specializing not only in the type of pattern but also on the different component parts. “The makers had ‘house’ patterns which distinguished their guns, and these patterns were cut to a high quality at a reasonable cost. They were delivered within a few weeks and in some cases a matter of days. This was achieved with two or three men working on the same gun by dedication to one area, such as the lockplates. The engravers spent no time on layout, being so familiar with the work that they could start cutting right away and concentrate on producing a high standard of work. 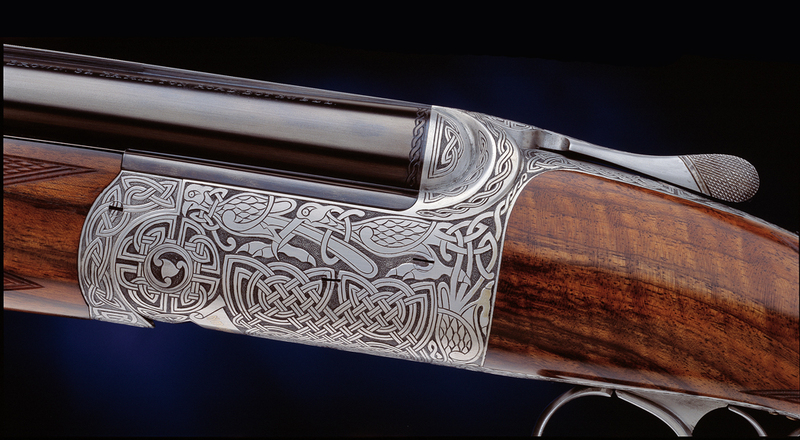 Most of our guns are engraved with our house Scottish scroll pattern. Creative Art can manage four per month, if required. In most cases this allows us to complete a commission in time for the following game season. 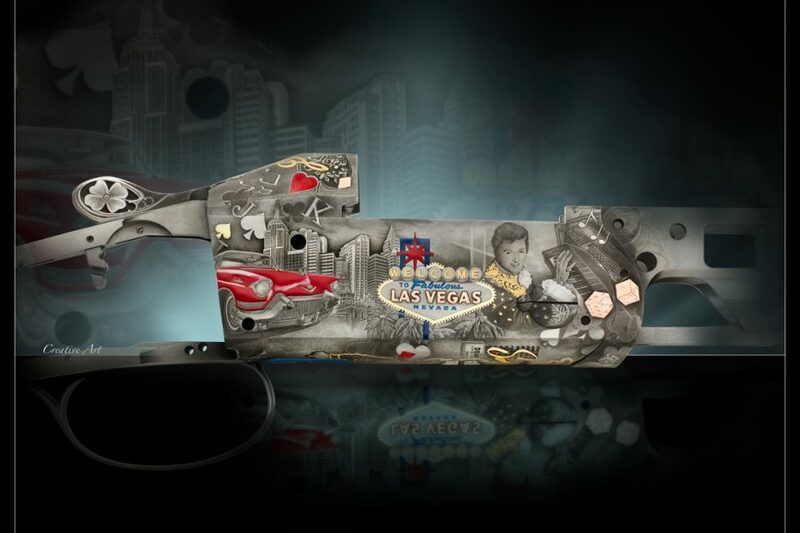 With the continuing demand for high-art guns in a world increasingly focused on instant gratification, the future of a business that produces quality work in a timely manner has carved itself a secure niche.